Do As I Say, NOT….. I was roaming around WordPress today checking out other run bloggers and came across Arkansas Runner Girl. The post was on will power. I realized that I’ve totally failed on that as of late. I read and shared on my facebook page this morning about the benefits of almonds for runners. In order to follow-up personally, I wanted to add some almonds into my routine today. I, of course, didn’t have any with me so I went over to Walgreens to grab some almonds for my desk. I needed an apple too so it was an easy decision even though I try to be religious about bringing all my food/snacks to the office with me. And then I noticed that Mars products were on sale today. 2 for $2. So I succumbed to the M&M temptation because they were “on sale”. Then what happened? 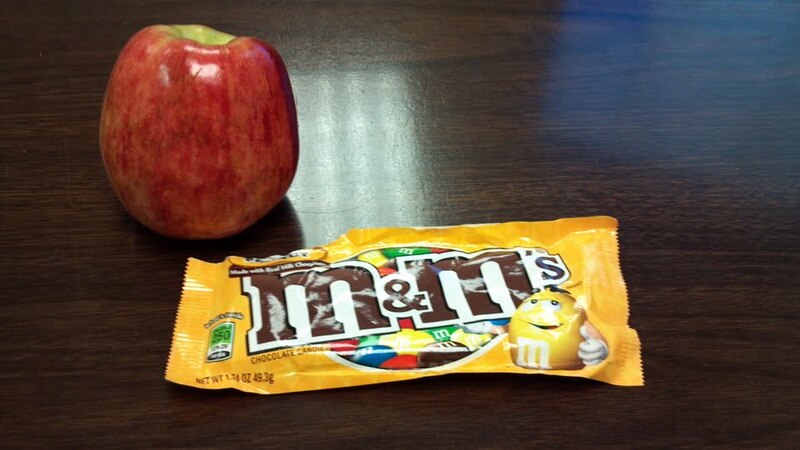 I ate the M&Ms and NOT the apple. I’m pretty sure this was a nutrition FAIL. Bottom line, do as I say, not as I do. Do the “sale” items always fall into your cart too or am I the only one with this problem? I probably wouldn’t have bought those stupid M&Ms if they had been full price! Now, I’m leaving to go run off those M&Ms. I’ll see YOU on the trail! This entry was posted in Running and tagged Arkansas Runner Girl, Running, willpower, WordPress by tootallfritz. Bookmark the permalink. You only have to run 100 yards for each M & M. This is why I pack my lunch and bring NO MONEY to work! If I brought money the vending machines constantly whispering my name would drive me nuts in failed nutritional choices. So I keep a bag of almonds, my handy dandy water bottle, a jar of PB and protein shakes in one drawer of my desk. Thus helping me control all “emergency” situations. I do have a “treat” container in my office for my students, I try to fill it with treats I don’t like or mint lifesavers as how many of those can a person eat at once? We won’t discuss the nutritional failure when I put the Easter bunny and chick sweet tarts in the treat jar ugh! Not to worry Amanda, tomorrow is a fresh new day. TTF…don’t worry bout the M&M’s….they have there place in diet. Just cause ya didn’t choose almonds, don’t worry. Ya…the almonds got some good vitamins and some healthy fat, you just opted to go for the quicker, energy-yielding sugar. The key I see is that ending of yours – going out to run off the M&M’s. Not sure how many calories the M&M packet has, but the real thing to be aware of is the calorie load of what you eat. Maybe the blog you cite promotes the benefits of almonds, but be aware almonds pack calories too. She cites “less than 200” but note she doesn’t say how much less – was it 190, 180, 150 calories or what for that 1-oz or 24 almonds? If you ate the apple and a handful of almonds, ya might be eating even more calories than the bag of M&Ms, but you would be taking in some pretty good micro-nutrients and such, and you would be getting a mix of carb from the apple and fat and protein from the almonds, vs 100% simple carb of M&Ms. The problem with that huge bag of almonds is once I opened it and took my handful of 24 almonds, I would find it tempting and hard to resist having more – LOL! Run…run…run….burn…..burn….burn. Isn’t that what runners do and live for?